Sarah has thrown herself into the maelstrom of living in each quarter-where time is measured in Sabbath sunsets and morning bells and calls to prayer, in stabbing attacks and check points-keeping the holidays in each quarter, buying bread from the same bread seller, making friends with people who were once her enemies, and learning some of the secrets and sharing the stories that make Jerusalem so special, and so exquisitely ordinary. 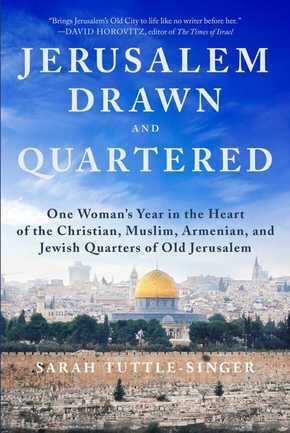 Jerusalem, Drawn and Quartered is a book for anyone who's wondered who really lives in Israel, and how they coexist. It's a book that skillfully weaves the personal and political, the heartwarming and the heart-stopping. It's a book that only Sarah Tuttle-Singer can write. The Old City of Jerusalem may be set in stone, but it's always changing-and these pages capture that.